Nearly four decades ago, 18-year-old William Leland Jr., a distant relative of Henry Leland, the founder of Lincoln and Cadillac, bought a highly well-equipped 1979 Pontiac Trans Am for $10,095. The Trans Am wasn’t to be driven or even washed, Leland ordered. When Leland died at the age of 42, his father took over ownership, and preserved the car according to his son’s wishes as a shrine. Now, after being passed on to a third owner, the car is on sale, having been preserved in pristine condition 39 years after it emerged from GM’s manufacturing facility in Norwood, Ohio.. 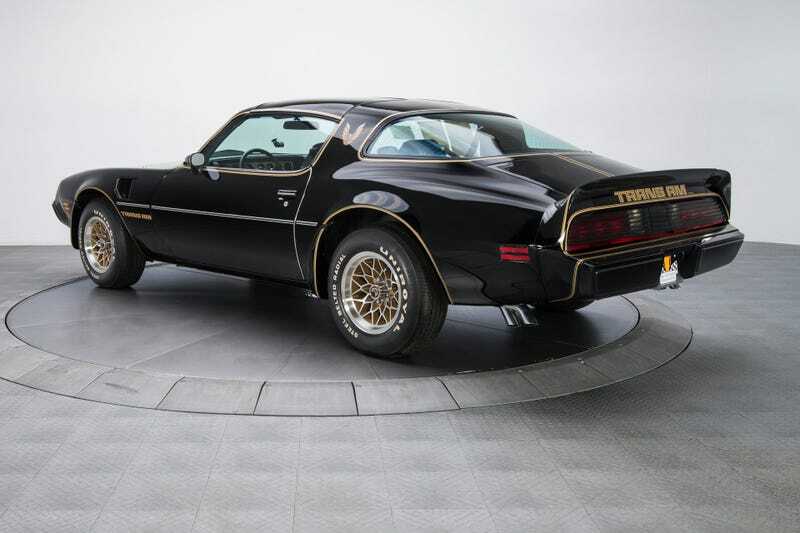 The North Carolina dealer RK Motors is listing the Trans Am at $159,900, or about 16 times what Leland originally paid for it. The pictures get me unduly excited, and make me to want to grow a mustache and buy some leather pants. It was also fired up once a month, and worked through its gears. It’s hard to imagine a 1979 Trans Am in any better shape. Under the hood is a pristine 6.6-liter V8 equipped with a four-barrel carburetor that pumps out 320 lb-ft of torque of torque, attached to a Turbo-Hydramatic 350 3-speed automatic transmission. You should buy this car. Or at least stare at it for awhile.